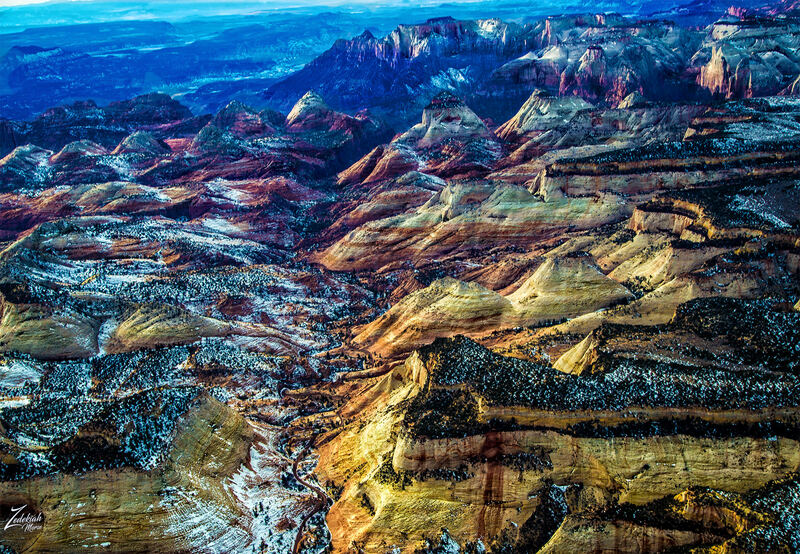 Checkerboard Mesa sits broodingly overlooking Clear Creek and the White Cliffs in this image lensed while flying and exploring the wilderness areas around Zion National Park in southern Utah. Zion is an otherworldly and somewhat foreboding place full of harsh and amazing looking formations. If you follow that road up the picture you see that it disappears into the mountain, this is where it goes into the Zion-Mount Carmel Tunnel at Gifford Canyon. This tunnel is 5,613-foot (1,711 m) long and was built from 1927 to 1930 and when completed was the longest non-urban road tunnel in the United States. The tunnel shortens the distance from the west side of Zion National Park to Bryce Canyon National Park by a distance of 70 miles. Checkerboard Mesa is a mass of slickrock with crossbedding etched into the north face of the rock. The imperfect vertical and horizontal fissures are a result of jointing and crossbedding. The checkerboard design has been created by weathering and erosion in the upper portion of the Navajo Formation. 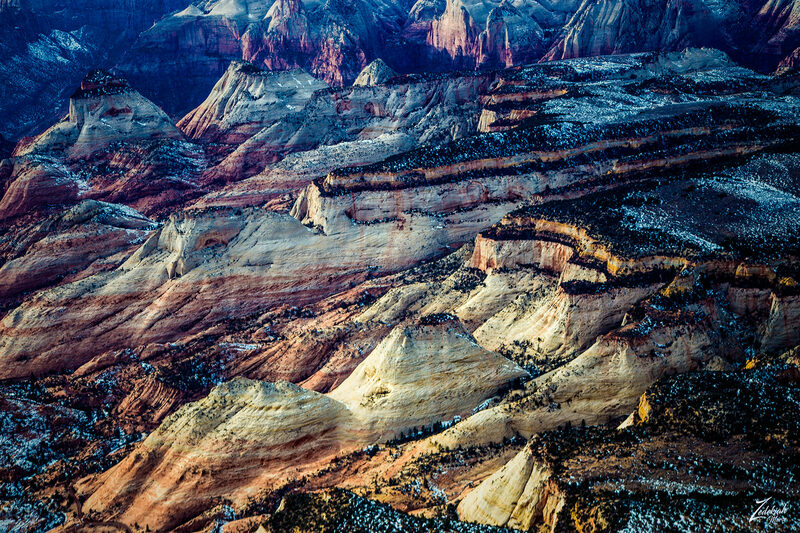 Checkerboard Mesa was named by one of Zion’s superintendents, Preston Patraw about 1938. Prior to that time, it was known as Rock Candy Mountain. Elevation: 6670 feet. 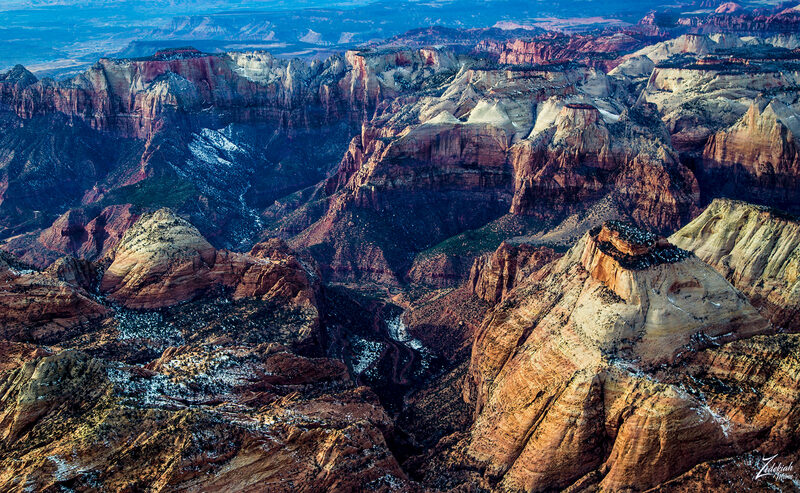 In this image we can see multiple iconic Zion landmarks; Bee Hive Peak The Three Marys, The East Temple, The West Temple, The Sundial, Altar of Sacrifice and Mount Kinesava.